The Bloody Bunch didn’t end with Ares & Eris. There was also the Marcia, Jan, & Cindy of insanity inducting vengeance as well, better known as the Furies. Originally written in May of 2011 after Osama bin Laden’s death was officially affirmed. Eteocles: Suppose we fall on them by night from ambush? Creon: Yes, if in the event of defeat you can return safely here. Eteocles: Night equalizes risks, though it rather favors daring. Creon: The darkness of night is a terrible time to suffer disaster. The mythological sources of the proper names used in Astrology and Astronomy almost always stem from the same kind of archeptypal, God-like personae, since they are evenly mirrored in both Greek and Roman Mythology. ….that is, until you arrive at Mars. The God of War was perceived by two drastically differing cultural perspectives from Man’s distant Past, dependent upon whether you lived in ancient Greece or were a member of the Roman Empire. One society of old deemed anything warlike or even overtly aggressive to be highly distasteful and dangerous to the soul, since it lowered a person to the base actions of animals. The other placed the act of War with its atmosphere of chaotic violence in the highest of regard, deserving the adulation of all, and worthy of the most esteemed prizes from their rulers. The Roman God of War was such the uber-masculine force of militarism, he oversaw every bit of violence, gore and of course blood, all by his manly god-like self. The ancient Greek version, on the other slapping hand, was a badly coordinated, mentally handicapped, rage filled klutz who would show up unannounced as well as uninvited with his enterage of War wanna-be’s and was such a reactionary dimwhit, mere mortals were able to trap his dumb divine self. 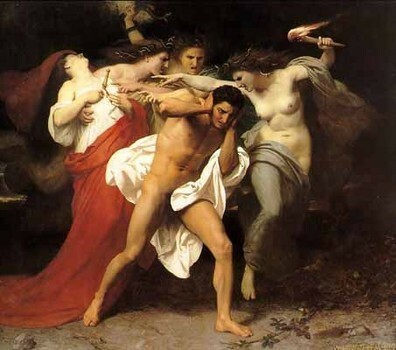 Where the Roman god Mars was a solitary source of mean masculinity, the Greek Ares came from a big family and was the only boy among a gaggle of the most ghastly girls. Guess which version humanity went with to forever embody the planet that represents Aggression, Rage, and anything related to War and the military? Hint: Russell Crowe’s career wasn’t made based on a film called “Philosophical Debator”. When it comes to our approach in dealing with the vast reaches of outer-space, it makes we miniscule humans feel big and important by applying consistency. Hence the names of the planets of our Solar System, with the exception of the planet known for not being in the norm, Uranus, are all named after the Pantheon of Gods from ancient Rome. Conversely, the major asteroids hurtling about were all given Greek names, more specifically, names of Greek Goddesses that comprise the “ancient feminine”, or said another way, the various dimensions of the personality of the archetypal woman. On the day of Osama bin Laden’s death, ancient Greek themes of War, Aggression, and Vengeance collided into the classical standards of the Roman Empire in a majorly expansive way, something karmicly akin to “Hey! You got your Roman skyscraper of chocolate in my Greek Great Lake of peanut butter!”. On that day, EIGHT heavenly bodies were placed in the sign of Aries – Mercury, Venus, Uranus, Lillith, the Moon, with the powerhouse planetary punch of Jupiter, Mars, and Eris being TNT packed exactly together at the 22nd degree in the sign of Aries. All of it opposed by Saturn in the sign of its exaltation, Libra. The grandiose mixing and matching of the ancient themes of Battle, Vendetta, and plain old brute force occurring at a concentrated point in the sign that rules over anything concerning the military and War, Aries, was mirrored here on Earth by the invasion, capturing, and killing of the most wanted man in the Western World on May 1st, 2011. However, the combining of these powerfully strong tales of antiquity serve as words of warning for the residents of this planet to not act in haste, to proceed with caution, and to realize that for every action, there is a reaction. Most importantly, The Universe is asking us to recall exactly what it was we have been fighting, killing, and sacrificing for, anyway?…. Your equally cute as he is mystical astrologer began a tradition a few years back. Instead of dredging up predictions of doom and gloom for the love children of Lady Gaga and The Donald every time we had to sing “Auld Lang Syne”, Brad made it a point to give yearly New Year’s predictions that would only benefit all of society. These prognostications of prosperity for the populace at large would be based on the movements of the planet of Blessings and Opportunity, Jupiter, throughout that particular calendar year. In that series, I discussed how Jupiter’s transition through the Mars ruled sign of Aries from January through June of 2011 should translate to blessings or fortunate opportunity occurring to both the military and the Pentagon since they both are under Aries’ domain. I’ll admit, with the planet of sudden, unexpected events, Uranus, joining the Aries planetary tour bus, I mistakenly interpreted a sudden event dealing with War and the military as automatically negative and dread-filled, resulting in me anxiously holding my breath for most of this calendar year. Needless to say, the Great Benefic’s presence in the sign of Aggression translating to the capturing and killing of Osama bin Laden came as quite a major relief. But even when considering the planet of Blessings and Fortunate Outcome, I emphasize there are good and bad, evolved/unevolved aspects to everything in the Universe. Case in point, Jupiter not only deals with sunshine and lollipops, the King of Planets also is associated with matters regarding wasteful expansion. A perfect example of this overdone amplification occurred in 2010 when the Great Benefic went for a deep sea dip in the oceanic sign of Pisces resulting in the BP Oil Spill in the Gulf of Mexico. The demise of Osama bin Laden is a major relief for much of the Western World, however neither I, nor the astrological Universe would translate this event as something to be deliriously joyful over. 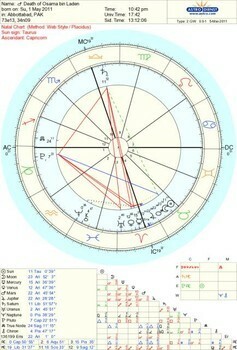 When a conjunction, or a positioning in the same area of the sky, occurs in Astrology, it serves to emphasize a point. Jupiter’s conjunction with Mars at the exact degree of Aries intimates that military force was a necessary means in order to bring about this relief causing event. What makes bin Laden’s death no laughing matter is the realization that positioned right next to the Great Benefic and the planet named after the Roman God of War stands the ancient Greek Goddess of Discord, Strife, and Confusion, Eris. Eris was the sister of the ancient Greek mythological version of Mars. The Goddess of Discord had a knack for making an entrance onto the world’s stage in the moments either directly before or after a major conflict or war, whenever we foolish mortals thought everything was said and done. She was hardly ever noticed at first, but if the Goddess decided to touch ground on Earth, she would remain planted and would immediately begin to grow until she became Titan-sized and able to touch Heaven. The terrifying thing about Eris is mistakenly assuming her actions are boisterously loud and obnoxiously attention getting, since she rules over such unnerving things as Strife and Confusion. Whenever the Goddess of Discord arrived on Earth, she would blend in with the antique wallpaper and perform the slightest of actions which would eventually snowball into periods of violent chaos which marked the history of Man. One of the greatest and bloodiest wars in all of ancient mythology came about due to Eris not being invited to a royal wedding, kind of like Fergie being slighted by William & Kate but with some seriously bad repercussions for the ancient world at large. Instead of making a huge, embarrassing scene at the wedding reception, Eris hid out of sight, and when both God and Royal Mortal had gathered for the great matrimonial feast, the Goddess of Confusion proceeded to toss a golden apple that quietly rolled right into the middle of the room. Engraved upon the dinky piece of fruit were the words “To The Fairest”. Naturally, Aphrodite, the Goddess of Beauty, went to pick it up when just then, her dainty hand was stepped on by the strappy sandal of Athena, whose hair, in turn, was then suddenly pulled back by Hera, when the Goddess of Wisdom dare assumed the smallish sized apple was for her when clearly it was intended for the Queen of the Gods. Leading to all Hell breaking loose, end resulting in the Trojan War…..
“With a daily environment filled with the stress and constant awareness of ever present danger from any given source, those who pay the price most dearly are the men and women in our military. Last October, I wrote a piece entitled “Past Pandora’s Pain: Buried Far Beneath Hope, Waits Communication”. In that piece I recalled having to pull over while driving my car due to being overwhelmed with shock at a radio report stating that the number of suicides amongst American military had gone beyond the number of American casualties in the Middle East. In that same piece, I stated that The Lord of Karma, otherwise known as Saturn, entered Libra on October 30th, 2009. Saturn was giving his “Life Lessons Learned the Hard Way” not only to Librans and anything dealing with one on one communications, but would also be affecting any one on one partnerships associated with the sign of Aries as well. Not too soon after changing signs, The Lord of Karma brought these themes to society’s horrified attention when it was still at the cardinal point of 0 degrees Libra, or put another way, a karmic concentrated point of notoriety, be it positive or negative. A mere 6 days later, the mass murders occurred at Fort Hood of American military personnel killed on American soil, at an American military base. My “Pandora” article tried to emphasize that communication within our military was overdue in being restructured so that it could serve as a constructive and many times, life saving tool for our men and women serving in the military. Unfortunately in the current day, any kind of therapeutic help is tacitly frowned upon not only by soldiers, but by their commanding officers as well, since talking about one’s pain or fears would be considered a sign of weakness. Devastatingly, Jupiter’s expansion occurred, but in the negative spectrum regarding this most grim of topics. Exactly one month prior to the death of Osama bin Laden, I once again was driving, and once again had to pull over, this time due to my tears impairing my vision when I heard the news announce the suicide of Clay Hunt on the radio. A Marine corporal who served in both Afghanistan and earned a Purple Heart medal for being wounded in some of the worst fighting in Fallujah, Iraq, Clay Hunt was a prominent advocate and memorable spokesperson for the non-profit group, IAVA, Iraq and Afghanistan Veterans. 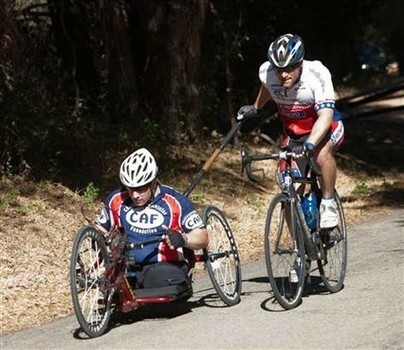 After his time in active duty, Hunt became one of the most vocal lobbyists on Capitol Hill for veteran disabilities. His charismatic good looks were used in IAVA’s ads encouraging veterans to seek support from an online network of fellow veterans, even appearing in a PSA for veteran suicide prevention. Aware of his ever growing physical and psychological obstacles, the Marine sought help for what was believed to be an overwhelming condition of survivor’s guilt, since he witnessed a number of his fellow Marines, 4 of them close friends, die while in combat. As I have stated in past occassions, Saturn’s lessons are best learned through concrete example. With The Lord of Karma positioned in the air sign of its exaltation, issues regarding the justice of communication would be brought to the forefront of society’s attention. The murders at Fort Hood marked Saturn’s entrance into Libra on November 5th, 2009, and indicated to all that little to no work had been done on the role and structure of communication within the military. Clay Hunt’s suicide occurs while Saturn is at the midpoint of its exalted trek. The young Marine who represented the voice of military veterans by urging the American government to better evaluate the needs of soldiers returning from the Middle East was not only silenced when he took his own life but his death serves as a tangible example of the misappropriation of Justice with The Lord of Karma positioned in the sign symbolized by the scales of Justice. The Pentagon has officially told the Corporal’s parents their son’s suicide was not a military death due to it occurring after his time of duty. The top brass of America’s military is denying the very assistance Clay Hunt fought for, by insinuating his untimely demise was caused after his service in the Marines, perhaps when he took part in rehabilitating road bike rides with veteran amputees or maybe when Hunt volunteered for Team Rubicon, traveling with veterans to Haiti and Chile on humanitarian missions after earthquakes. 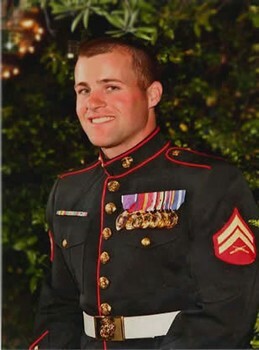 To reinforce this travesty of Justice, former Marine Corporal Hunt took his life on March 31st, 2011 when he was 28 years old. Saturn works in 28 year cycles and the age of 28 is when we experience our “Saturn Return”, the time when astrologically we become adults. Americans rejoice over the death of Osama bin Laden. Why? Not because Justice has been served. How can it when the very reason why people like Clay Hunt enlisted in the military and sacrificed so much, including his own life, was to defend his country against the actions of the likes of the terrorist leader. The country whose foundation is based in the belief of “Justice for All” has turned its back on Justice through its disregard of the Marine’s life of example and heroic efforts. Mythology doesn’t just refer to old as dust stories that came about due to early civilizations of humans not having access to cartoons or DVD’s, a myth can still occur, even today! The death of Osama bin Laden is already gaining mythic proportions due to the date of his death just happening to be 66 (a 3rd would make it all a bit too garishly obvious, no?) years to the day after Adolf Hitler took his cowardly final exit of this world. (Not before making sure the poison he ingested was good and deadly by having his German shepherd, Blondie, followed by his human Blondie, Eva Braun, chow down and convulse to death on the stuff first before helping himself.) Now, if Hitler was the most evil person of the 20th century (he got knocked down from most evil, ever), then surely bin Laden wins the title of Most Evil of the 21st. In some hysterical cases, the terrorist leader’s mythic influence has been amped up by being given rulership over Evil in its entirety, since bin Laden is being likened to the modern day Mefistofele, or in easier to understand Biblical terms, The Anti-Christ himself. Keeping in mind how Eris operates, it is imperative we do not fall into the trap of thinking now that Ding, Dong, the Anti-Christ is dead, everything will all work out and terrorism is forever vanquished! 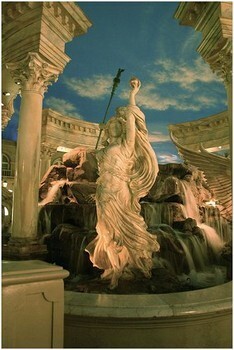 Eris enters whenever mortals foolishly feel all is said and done and everything is complete. Seeing the joyful reactions of the American public in the streets and other public venues to the death of bin Laden only creates seeds of Vendetta which begin to germinate in the hearts of many upon viewing such folly. Plus, Starting or listening to mythic rumors of bin Laden being the vanquished Anti-Christ is a perfect tool to lull us into false hope right before Eris commences her dirty work. Not only are we receiving warning to proceed with caution going forward and veer from over-reaction about the death of bin Laden through the conjunction of Eris with Mars and Jupiter in Aries, the suicide of Clay Hunt is an exalted Saturn’s mid-point symbolic calling card concretely showing that society has not taken The Lord of Karma’s tasks to heart by allowing Justice to be disgracefully overlooked in matters focusing on communication as a crucial tool for survival. If society continues to disregard both The Lord of Karma and Justice, The Universe will then need to exercise more drastic punitive measures by summoning The Furies. I mentioned earlier the Greek God of War, Ares, came from a big family. Eris and Ares weren’t the only members of the Bloody Bunch of ancient Greece, there were more sicko siblings. The Greek God of War had 3 additional sisters, a trio of sheer terror who, when summoned, all hope was lost and doom was imminent. The Marcia, Jan, & Cindy from the bowels of Hell were Alecto, “Relentless Rage”, Megaera “The Grudge”, and Vendetta personified, Tisiphone. Together these ghoulish girls were known as The Erinyes, or in English, The Furies, the source from which the words “furious” and “infuriated” are derived. The Furies emerged from Hell only in the most extreme matters when Justice was desecrated, since they were relentless with their torture and pitiless with their taunting and harassment. When The Furies came to visit, they wouldn’t leave until the guilty person’s life was annihilated, either by his own hand due to being driven to madness or by having the guilty one have the misfortune of being left alone with the Blister Sisters unattended for a few minutes and having the girls’ razor sharp talons remove whatever skin was showing (scrunching nose and giggling). The Death of Osama bin Laden is a day to mark in the history of modern man to be sure. However, not only is vigilance needed going forward, but much more work needs to be done to better serve the men and women who serve us in the military. Saturn’s positioning in its exaltation in the air sign of Libra reminds us that major alterations still need to be made regarding communication, since it is a crucial tool if we are to survive as a functioning evolved society. Humanity needs to ensure that the spring of 2011 isn’t remembered as the lull before Eris’ storm of Discord befell the world, or worse, as the Family Reunion of The Bloody Bunch from mythic times of old. *5/5/2011 – As more information is released regarding the actual invasion of bin Laden’s Pakistani compound, I am astounded how the plan of attack was Aries-esque in every way. Being the first sign of the Zodiac, the most optimal atmosphere the sign of the Ram functions best in is a never before attempted, action filled, first of its kind, trial by fire. Aries energy has no time nor interest in extensive preparation or trial practice runs, since those things kill the fuel which motivates the fire sign – spontaneity. The helicopter which nearly crashed upon the Navy Seals’ landing held the potential to turn the top secret mission into a catastrophic disaster. The cause of the helicopter’s mechanical malfunction still has yet to be determined, but what is known as of late, is the aircraft was the most updated, technologically advanced model of helicopter which can fly undetected by radar and the invasion of the bin Laden compound was the first time it was used in active duty! Uranus rules over flying craft and only the presence of the Great Benefic nearby in the same sign of the military and of covert missions prevented this seemingly seamless 40 minute flurry of action (and flame) from turning into the 21st century version of The Bay of Pigs. Chart cast for the death of Osama bin Laden on May 1st, 2011. Note nearly everything lying below the horizon emphasizing the extremely covert nature behind his demise. The Goddess of Discord, Eris, as she is about to bring about devastating war through the simple act of tossing just one dinky apple.